Our resort is centrally located on Curacao right on the sea in the picturesque fishing village of Boca St. Michiel, commonly called Boca Sami. It is 11.5 km (15 minutes by car) from the historic center of Willemstad, 10 km (12 min) from the airport and 40 km (35 min) from the most distant beach at West Point. A large supermarket is just a 5 minutes drive from Sun Reef and in the village is a mini market. The local restaurant Waterfront Terrace is within walking distance. For golf enthusiasts, the beautiful golf course of Blue Bay is a stone's throw away. From the airport (15-20 minutes). When leaving the airport, take the first right in the direction of Willemstad. Follow this road straight ahead until you have reached the roundabout with the Iguana statue. Take the second right on the roundabout to continue on the same road. Turn right at Centrum Supermarket and take a left turn after Blue Bay Resort in the direction of St. Michiel. 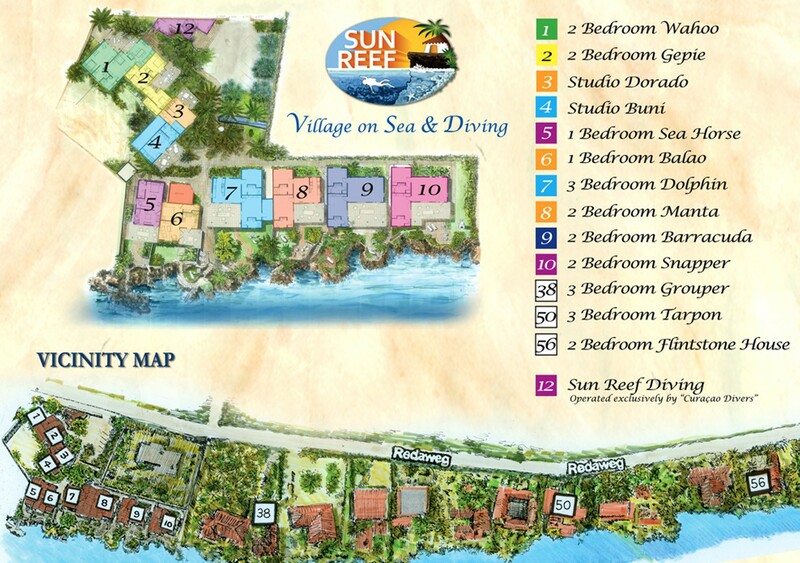 Follow the road straight ahead and you will see the first signs of Sun Reef Village. Follow the signs and you will arrive at our resort in less than 5 minutes.